March 25, 2019 Malibu, CA – The world's preeminent classical guitar competition, the Parkening International Guitar Competition, has selected 15 standout competitors for its fifth triennial competition. Representing six countries, they will vie for the largest prize purse among guitar competitions, competing at Pepperdine University from Thursday, May 30, through Saturday, June 1, 2019, on the University's campus in Malibu, California. Renowned guitar virtuoso Christopher Parkening, the competition's namesake and artistic director, is Distinguished Professor of Music at Pepperdine's Seaver College. The competition honors his lifetime commitment to fostering musical excellence in young artists as demonstrated by his mentor, Spanish guitarist Andrés Segovia. The 15 competitors range in age from 19 to 29 years old and are among the international community's most talented guitarists. They are Bokyung Byun, 24, Los Angeles, California, USA; Riccardo Calogiuri, 29, Italy; Javier García Verdugo, 25, Spain; Samuel Hines, 27, Mora, Minnesota, USA; Alec Holcomb, 23, Carmel, Indiana, USA; Junhong Kuang, 19, Baltimore, Maryland, USA; Beiyan Liu, 20, China; Christopher Mrofchak, 27, Tallahassee, Florida, USA; Cody Noriega, 26, Riverside, California, USA; Alex Park, 26, Culver City, California, USA; Miguel Checa Paz, 20, Spain; Sergey Perelekhov, 21, Russia, USA; Andrea Roberto, 23, Italy; Marko Topchii, 28, Ukraine; and Tengyue Zhang, 25, China. 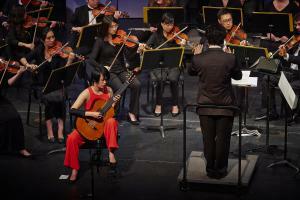 "We are thrilled to bring such a diverse range of young guitarists from all over the world here to Southern California for what is sure to be an extraordinary week of music," says Rebecca Carson, Executive Director for the Parkening International Guitar Competition and Managing Director for the Lisa Smith Wengler Center for the Arts. "Our competitors are united by their passion for classical guitar and by their love of music. We are looking forward to welcoming all of them to Pepperdine." Judging the competition will be Mia Bongiovanni, Assistant General Manager of Media and Presentations for the Metropolitan Opera; Charlotte Lee, President and Founder of Primo Artists; Steve Schoen, former Vice President of Sony Music Masterworks and Sony/BMG; David Thomas, recording producer; and Pablo Sáinz Villegas, classical guitar virtuoso and winner of the 2006 Parkening International Guitar Competition. Three of the competitors will advance to the final round on Saturday, June 1 to perform a concerto with the Young Musicians Foundation Debut Orchestra before a live audience in Pepperdine's Smothers Theatre. The gold, silver, and bronze medalists will be announced at the conclusion of the final round. 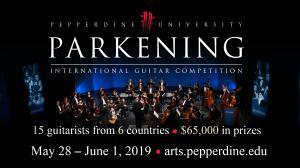 In addition to the Parkening International Guitar Competition, Pepperdine will present the Parkening Young Guitarist Competition on Tuesday and Wednesday, May 28 and 29. The 10 competitors, ages 17 and younger, are Hilbert Chen, 10, Cupertino, California, USA; Maggie Grether, 15, Pasadena, California, USA; Joseph Malvinni, 11, Santa Barbara, California, USA; Mira Morales, 14, Los Altos, California, USA; Evelyn Nguyen, 16, Monrovia, California, USA; Garrett Podgorski, 17, Burbank, California, USA; Nikolas Rejto, 17, Australia; Eric Wang, 14, San Jose, California, USA; Darren Wu, 16, San Jose, California, USA; and Hui Chan Yun, 16, South Korea. The competition, which debuted in 2006, offers the largest prize purse of any classical guitar competition in the world, with competitors vying for cash awards that total in excess of $65,000. After three days of intense public performances, the winner of the Parkening International Guitar Competition receives a gold medal, the Jack Marshall Prize of $30,000, and the most prestigious title in classical guitar. The 2019 Parkening Competition is made possible by a generous grant from Howard and Roberta Ahmanson, as well as Frank Marshall and Kathleen Kennedy. For information about tickets, call the Smothers Theatre Box Office at (310) 506-4522. Information online: arts.pepperdine.edu/parkening. Christopher Parkening is celebrated as one of the world's preeminent virtuosos of the classical guitar. For over 40 years his concerts and recordings have received the highest worldwide acclaim. Parkening is recognized as heir to the legacy of Spanish guitarist Andrés Segovia. He has performed at the White House, appeared with Placido Domingo on Live from Lincoln Center, participated in the Carnegie Hall 100th anniversary celebration, and performed twice on the internationally televised Grammy Awards, and has appeared on many nationally broadcast television programs, He has collaborated with composers John Williams, Elmer Bernstein, Joaquin Rodrigo, F. Moreno Torroba, and Mario Castelnuovo-Tedesco and premiered new concert works in an effort to keep the guitar in the musical forefront. He is the recipient of two Grammy nominations in the category of Best Classical Recording. He was given the acclaimed American Academy of Achievement Award for excellence in the field of music. He also was presented with the 2000 Orville H. Gibson Lifetime Achievement Award for Best Classical Guitarist and the 2003 University Musical Society's Distinguished Artist Award. Pepperdine University is an independent, medium-sized university located on the a 830-acre campus overlooking the Pacific Ocean in Malibu. Pepperdine is ranked in the top tier of major universities in America and is known for achieving the highest standards of academic excellence in its undergraduate program, and in its School of Law, the Graziadio School of Business and Management, School of Public Policy, and Graduate School of Education and Psychology. Pepperdine University is religiously affiliated with the Churches of Christ. It is the purpose of Pepperdine University to pursue the very highest academic standards within a context that celebrates and extends the spiritual and ethical ideals of the Christian faith. The Lisa Smith Wengler Center for the Arts at Pepperdine University provides high-quality activities for over 50,000 people from 1,000 zip codes annually through performances, rehearsals, museum exhibitions, and master classes. Located on Pepperdine's breathtaking Malibu campus overlooking the Pacific, the center serves as a hub for the arts, uniquely linking professional guest artists with Pepperdine students as well as patrons from surrounding Southern California communities. Facilities include the 450-seat Smothers Theatre, the 118-seat Raitt Recital Hall, the "black box" Helen E. Lindhurst Theatre, and the Frederick R. Weisman Museum of Art.